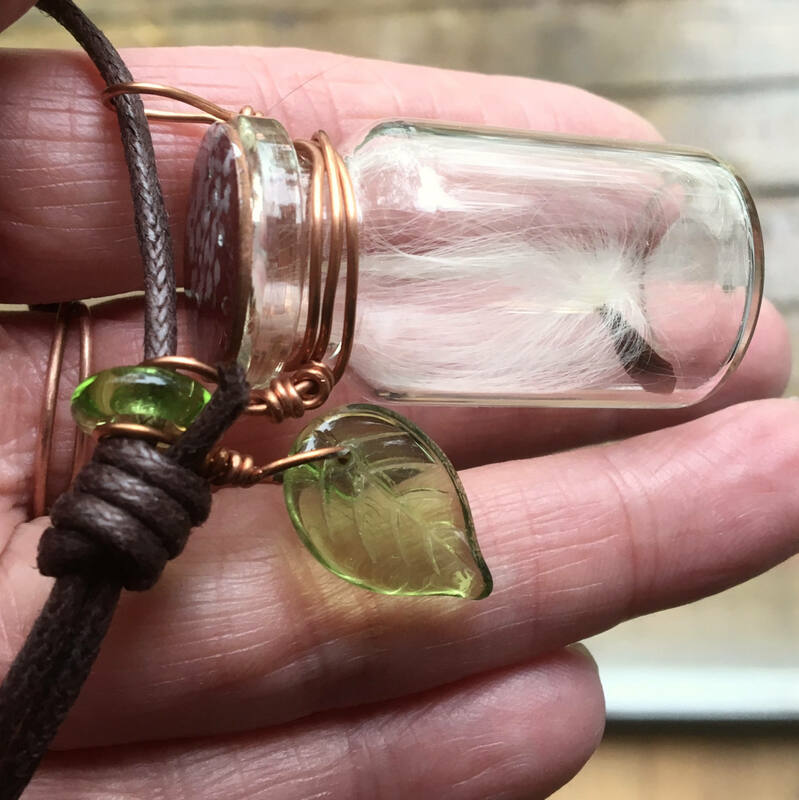 Wear your love of nature, butterflies, botany and art jewelry with this original necklace holding a milkweed seed in a bottle. 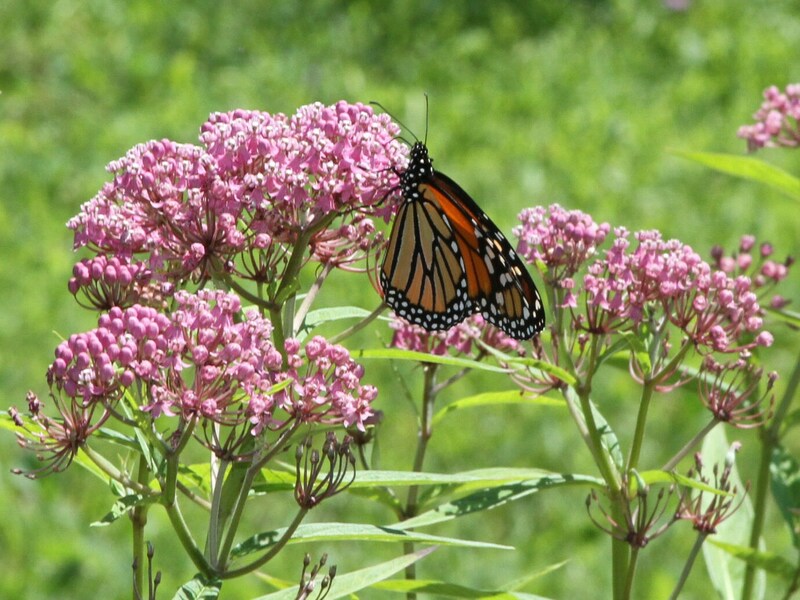 Monarch butterflies depend on Milkweed, as Asclepias is often called. It is the only host plant for these butterflies to lay their eggs on, for their larvae to develop on. 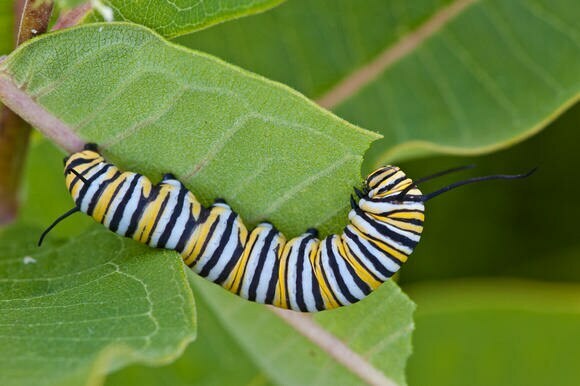 This special butterfly, known for it's amazing annual migration from Mexico to Canada and back, reproduces by laying eggs on Milkweed where the larvae eat and grow and in time, form a chrysalis and emerge as new butterflies. I made this piece to help build awareness that to save the Monarch, we must PLANT MILKWEED!!! You may also add seeds to your order if you can help grow these plants! 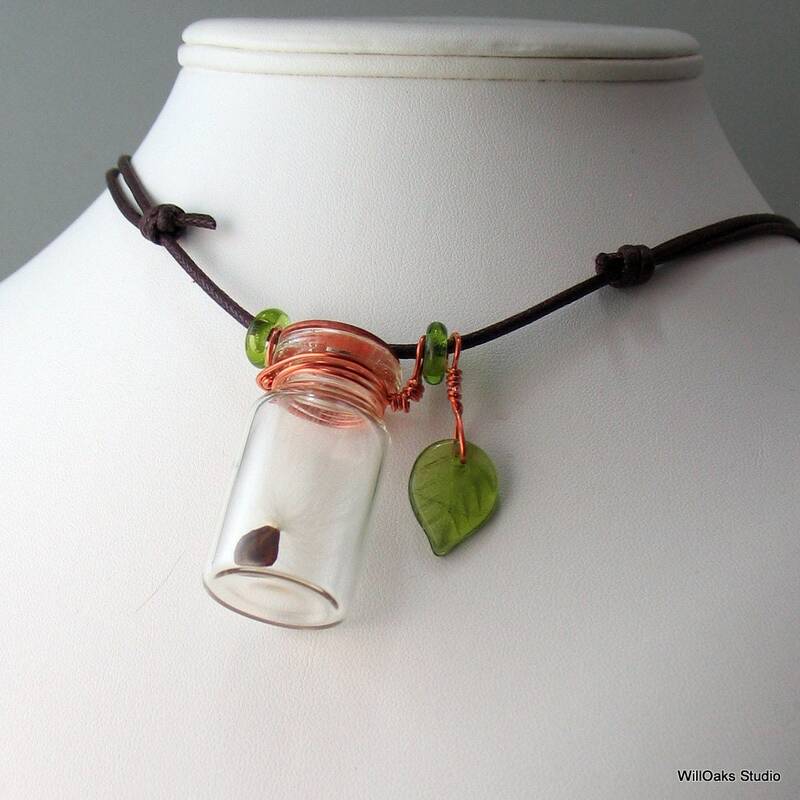 The art jewelry necklace, a little bit geekery in the botanical sense, features a small clear bottle, 1 1/2" tall and 7/8" in diameter, bound in copper wire. An Asclepias seed, complete with its' floss, is permanently captured in the bottle. The bottle is "capped" with a hand enameled copper circle, 18mm in diameter, where I've made an abstracted image of the flower of the milkweed plant in a shade of enamel that's similar to colors found in the flowers freshly blooming in summer. This artistic 'bottle top" of kiln fired, vitreous enamel is permanently epoxied to the top of the clear glass vial. 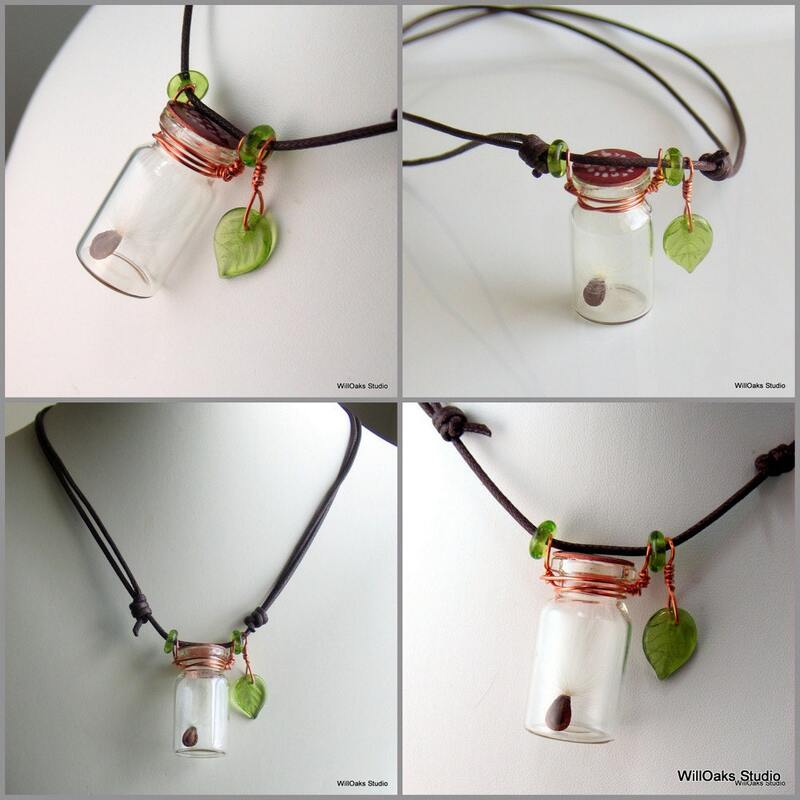 The seed vial is added to a sliding knot necklace of waxed cotton. 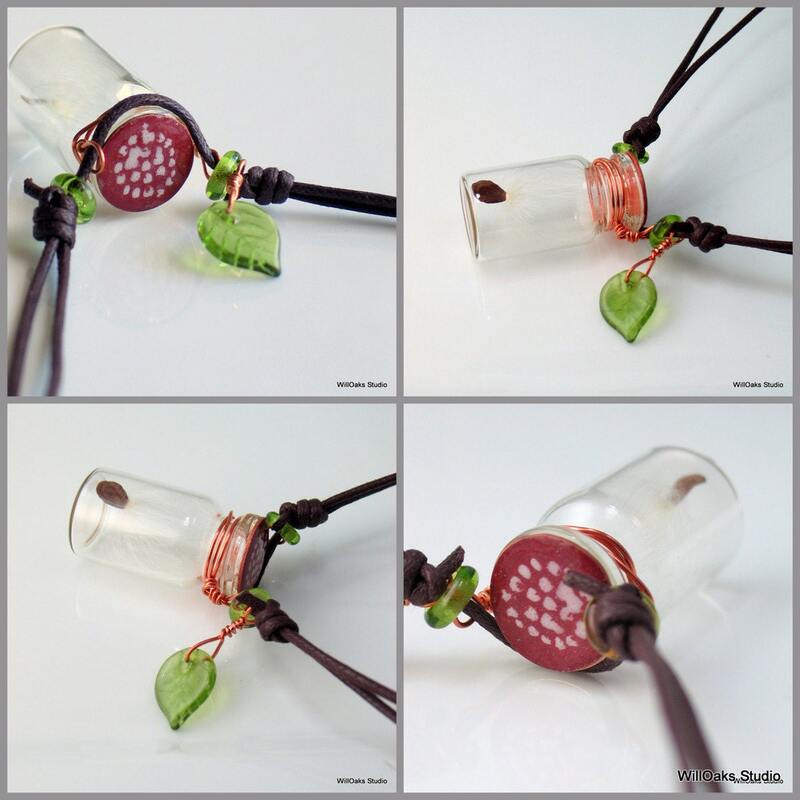 Two Czech glass circles flank the bottle, and a single larger green Czech pressed glass leaf is wire wrapped to hang at one side. Necklace can adjust from between about 17" at the shortest, up to as long as about 35" fully extended. I developed this design not just because of my love for all things of botany and nature, but because the Monarch Butterfly is becoming a very threatened species. On our farm, we have vast areas of milkweed, their host plant, that used to be heavily populated by Monarch lavae or larvas every summer. Very few butterflies returned this summer, and I find this alarming. I learned that loss of habitat, in particular loss of the host plant Milkweed, is a contributing factor, so I worked to design a wearable art piece that could help call attention to this. I learned that many kids are learning about this in their classrooms, and were quick to understand the idea behind this design. 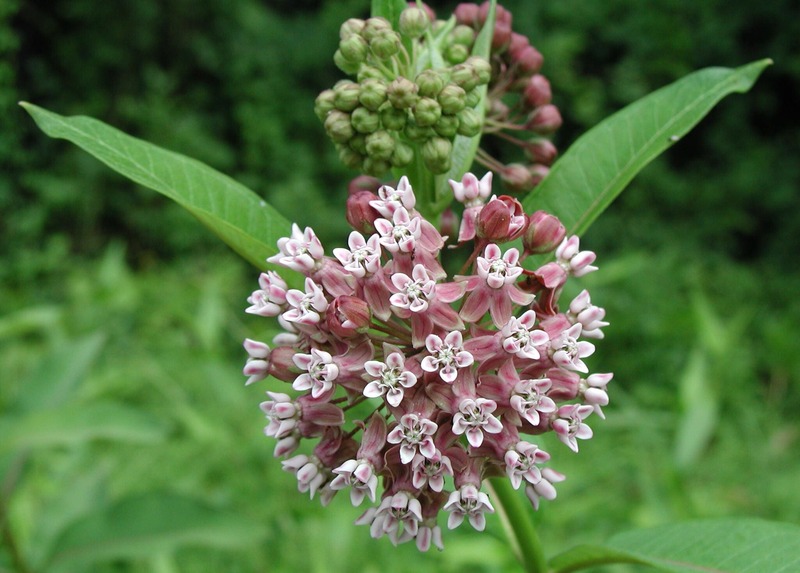 I learned that many gardeners are either adding this plant to their plantings, or are working with community neighborhood groups to create butterfly gardens or otherwise incorporate Asclepias into new plantings. And I believe the threats to Monarchs can be mitigated through understanding, knowledge and awareness, which can lead to action, to protect and repair habitat and migration routes from Mexico, through the US east of the Rockies, and all the way into southern Canada. 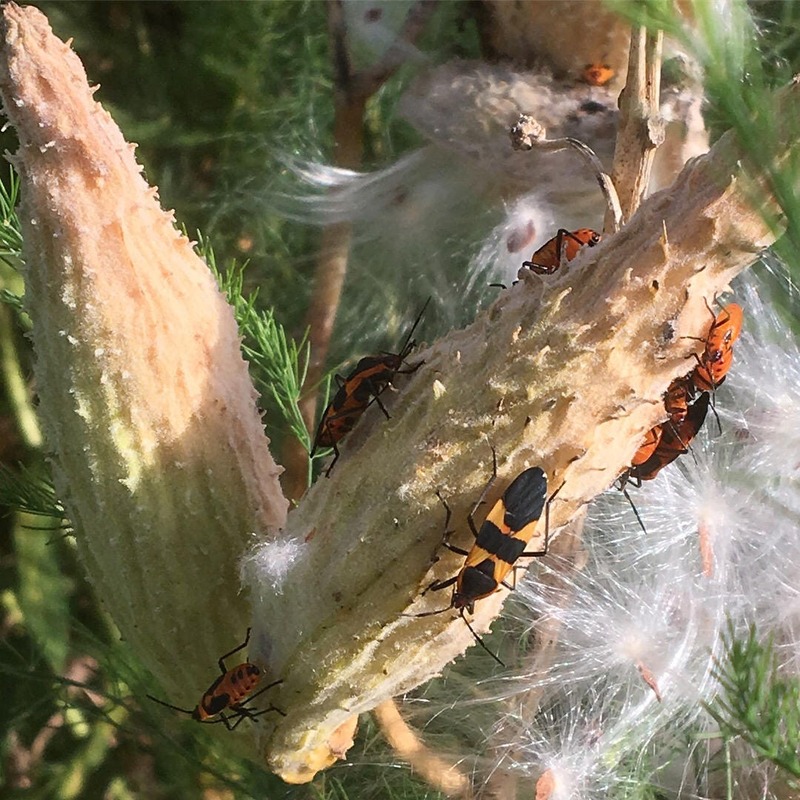 I'm also offering an optional packet of fresh seeds that you can plant to grow your own Milkweed, if you have a larger rough area that could support this. Select this option (or decline) at check out, while supplies last. This artisan necklace is a limited edition and since each copper circle is made by hand, there is variation in this part of my design, making each bottle necklace unique. And finally, as a wonderful "coincidence," Asclepias is also the Greek God of health, medicine and healing. According to history, he was originally a mortal who served as a physician to soldiers, as noted in Homer's Iliad. Elevated to god status, as the god of medicine, healing, rejuvenation and physicians, he's represented even in modern times by the serpent entwined staff. 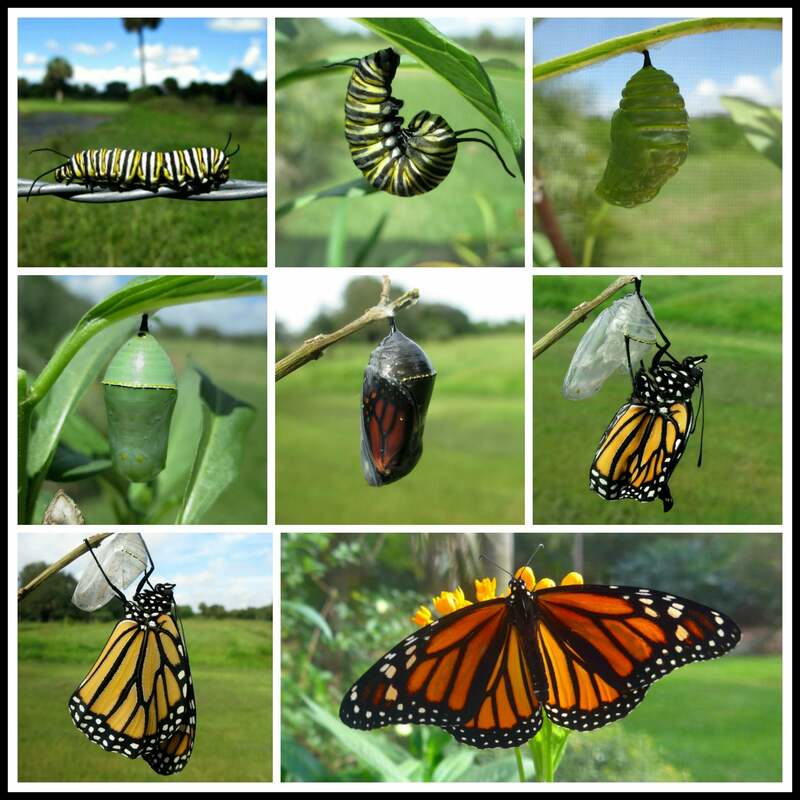 What I find hopeful about this is the concept of healing the plight of the Monarch Butterfly, by nurturing awareness and action to help heal the environment needed by her to rebound and to thrive. Price includes gift packaging in a brown velvet pouch, packing, postage, and mailing in the USA. Please contact me here to discuss quantity discounts. Sorry, I cannot mail this necklace internationally as seeds and plant products are too often subject to quarantine. 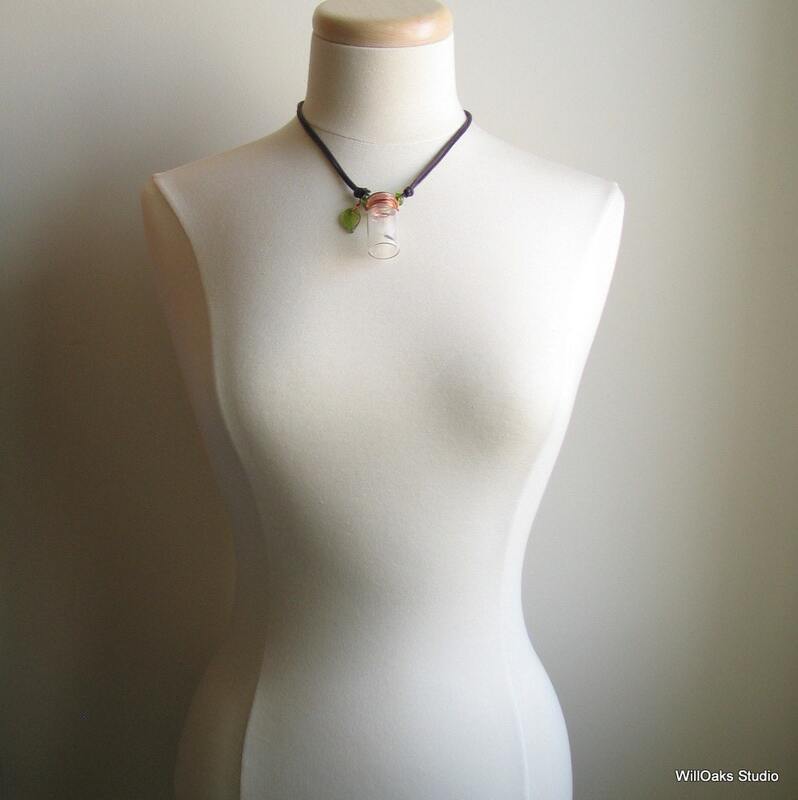 Please enter the front of my studio here https://www.etsy.com/shop/WillOaksStudio?, where you'll find other art jewelry, including many inspired by nature. Visit my "about page" here for a peek at the farm and source of much of my inspiration. Drop me a note with any questions or comments. That little jar is so sweet and the little glass leaves. I love this.